Thank You, I am very interested. I have not been able to find a schematic online. Thank you. Would you happen to know what the other device is called? I got the parts to build that circuit recently, and put one latch together(with the proper power/enable going to the IC). When i plugged it into the power supply, both lights came on, the motor switched when the switch was pressed, and a couple seconds later, the IC started to smoke. I looked over it many times, and found no mistake. When my Dad came home (electrical engineer) and looked at it, he found no mistakes. He removed the motor from the circuit, replaced the burnt IC, and the lights worked fine, alternated when activated by the switch. Did you have this experience when you built this circuit? Did you make any changes when building the circuit? I can see exactly why - my fault. I remembered my circuit wrong (it was several years ago that I last used it). The reason it is not working is power is flowing from the supply through the unused coil and out through the IC. I have drawn in the power to the motors wrong. What should be happening is the AC supply is rectified, and DC is supplied to the motors. The motors then have a diode across them to prevent inductive kickback. The Atlas motors as far as i have read (like PECO motors) are fine to use DC. Below is a corrected diagram with some notes of fixes. 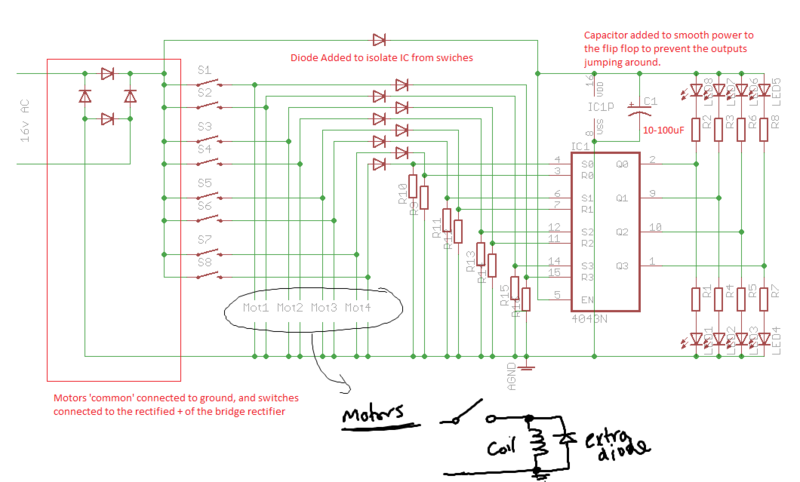 At the bottom is a little sketch to show how the protection diodes should be attached to the motor. Hey. Thanks for the update. It worked. However, with the capacitors i used, I was getting 22.8 volts going into the IC, when it is only made to handle 18. This worked, and didnt burn the IC. Just to be careful though, I added a 15V regulator, and brought it down to a better voltage. While waiting for the regulators to come, I worked on wiring my track. For now I am going to run on DC. If I decide to cross over to DCC later, I have enough connections to make it smooth. I am also waiting to get my poly-carbonate sheets for the control panel. 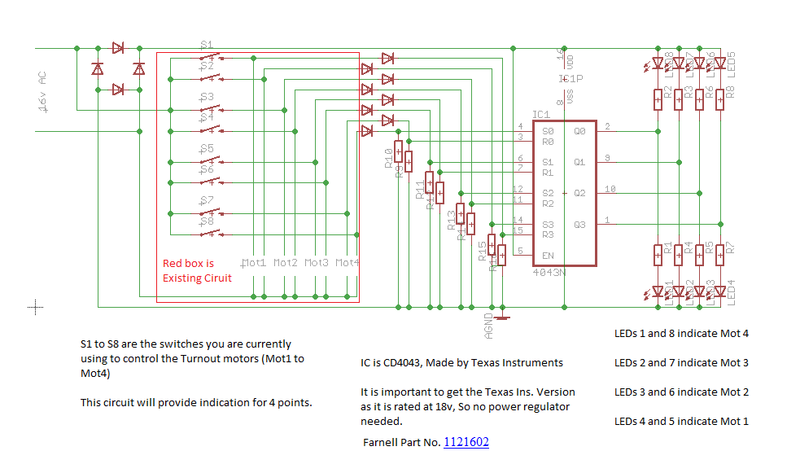 Once I receive that, I will finish building 2 of the circuits above to run my 7 switches. What other components are convenient to have on a control panel? Glad it worked for you . About the high voltage, there are two possibilities, either the power supply is unregulated and has strayed from its nominal, or the multimeter is registering peaks as opposed to RMS - which is the equivalent DC level in terms of power - RMS = PEAK/sqrt(2) = 22v / sqrt(2) = 16v, so i doubt it will damage the IC. Even so, a 15v regulator as you say will make sure things stay at safe levels.